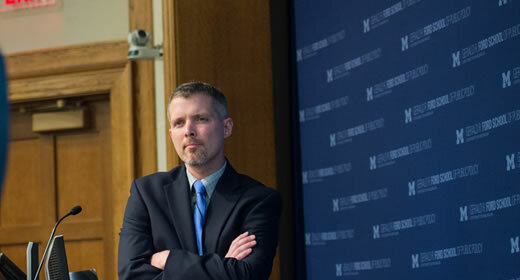 H. Luke Shaefer, associate professor of public policy at the Ford School and director of Poverty Solutions, was honored this week with the University of Michigan’s Faculty Recognition Award. He is among 22 faculty members honored during this annual award period. The award recognizes Luke’s research and scholarship on poverty and social welfare, his mentorship of students, and his leadership of the Office of the President’s Policy Solutions initiative. The award is intended for mid-career faculty who have demonstrated remarkable contributions to the university through achievements in scholarly research or creative endeavors; excellence as a teacher, adviser and mentor; and distinguished participation in service activities of the university and elsewhere. Shaefer’s research on poverty and social welfare policy in the United States has been published in top peer-reviewed academic journals and has been supported by the National Science Foundation, the Abdul Latif Jameel Poverty Action Lab, the Bill and Melinda Gates Foundation, and other funders. Shaefer has presented his research at the White House and before numerous federal agencies and congressional committees. He has consulted with a number of the nation’s largest social service providers as well as numerous community-based agencies. His work has been cited in The New York Times, the Washington Post, The Atlantic, the LA Times, and more. His recent book with the ethnographer Kathryn Edin, $2.00 a Day: Living on Almost Nothing in America, has been described as “path breaking” by many scholars.